A unitary state is a state governed as a single power in which the central government is ultimately supreme. The central government may create (or abolish) administrative divisions (sub-national units). Such units exercise only the powers that the central government chooses to delegate. Although political power may be delegated through devolution to local governments by statute, the central government may abrogate the acts of devolved governments or curtail (or expand) their powers. 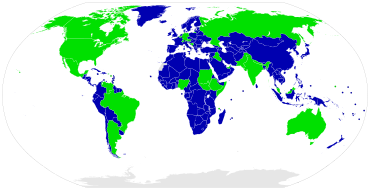 A large majority of the world's states (165 of the 193 UN member states) have a unitary system of government. Unitary states stand in contrast with federations, also known as federal states. In federations, the sub-national governments share powers with the central government as equal actors through a written constitution, to which the consent of both is required to make amendments. This means that the sub-national units have a right of existence and powers that cannot be unilaterally changed by the central government. The United Kingdom of Great Britain and Northern Ireland is an example of a unitary state. Scotland, Wales and Northern Ireland have a degree of autonomous devolved power, but such power is delegated by the Parliament of the United Kingdom, which may enact laws unilaterally altering or abolishing devolution (England does not have any devolved power). Similarly in the Kingdom of Spain, where the devolved powers are delegated through the central government. Many unitary states have no areas possessing a degree of autonomy. In such countries, sub-national regions cannot decide their own laws. Examples are Romania, the Republic of Ireland and the Kingdom of Norway. Territorial organization of some European countries. For European Union states, Austria, Belgium and Germany are federal states. Italics: States with limited recognition. ^ "What is a Unitary State?". WorldAtlas. Retrieved 2019-02-22. ^ "Democracy". www.un.org. 2015-11-20. Retrieved 2019-02-22. ^ Ghai, Yash; Regan, Anthony J. (September 2006). "Unitary state, devolution, autonomy, secession: State building and nation building in Bougainville, Papua New Guinea". The Round Table. 95 (386): 589–608. doi:10.1080/00358530600931178. ISSN 0035-8533. ^ Devolution within a unitary state, like federalism may be symmetrical, with all sub-national units having the same powers and status, or asymmetric, with sub-national units varying in their powers and status. ^ "unitary system | government". Encyclopedia Britannica. Retrieved 2017-08-11. ^ Svalbard has even less autonomy than the mainland. It is directly controlled by the government and has no local rule. ^ "Story: Nation and government – From colony to nation". The Encyclopedia of New Zealand. Manatū Taonga Ministry for Culture and Heritage. 29 August 2013. Retrieved 19 April 2014. ^ "Social policy in the UK". An introduction to Social Policy. Robert Gordon University – Aberdeen Business School. Archived from the original on 4 July 2014. Retrieved 19 April 2014.